Attorney volunteers sit in the jury box and score the Mock Trial Competition while student teams present their case to a judge or commissioner. Scorers are given a set of criteria for rating the teams numerically. The criteria for scoring includes the quality of the students' presentations, their grasp of the law and court procedures, and their understanding of the case itself - NOT the legal merits of the team's case. Before the Competition, please download the Case Brief and the Judge-Attorney Handbook and review them in order to score the mock trial. The time commitment is approximately two hours per trial. You may sign up below to score as many trials as you wish. If you would like to score in the same courtroom as another attorney, please indicate their name when you sign up. Please review the list of Attorney Coaches and Participating Schools to see if you would have an actual conflict scoring any high school team. 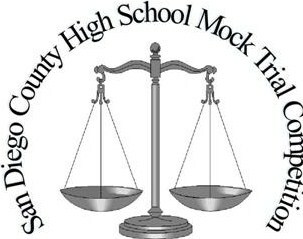 If you serve as a judge, scorer, or advisor during a practice or scrimmage for any San Diego County high school team or teams during the competition year, you are not eligible to serve as an Attorney Scorer during the actual Mock Trial Competition. If you have a child or grandchild participating this year in the Mock Trial Competition, you are not eligible to serve as an Attorney Scorer. Thank you for volunteering as an Attorney Scorer.